We can all agree that neutrals are a wardrobe essential for most women. But what else do you consider a wardrobe essential in your closet? For me there are a few patterns that I call essentials like plaids, checks and stripes. These are patterns that most women have at least one of in their closet and they are what I call “no print patterns” which are classics patterns. Today’s look is a combination of a few of these essentials. I started out with our Ecru Cascading Collar Casual Jacket, which I first debuted for you here. The Ecru color, which is actually just like a tan, is a great neutral color that works throughout all four seasons. The soft fabric of this particular piece makes it perfect for spring and summer. It is a casual jacket that you can wear for the weekend, or a date night. Some of you may even be able to wear it to work as well, depending on how corporate your office environment is. I have paired it today with our Blue Plaid Shirt with Roll up Sleeves which I first debuted for you here. This piece is also made out of wonderful soft fabric, making it perfect to wear under a jacket or on its own for warmer months. 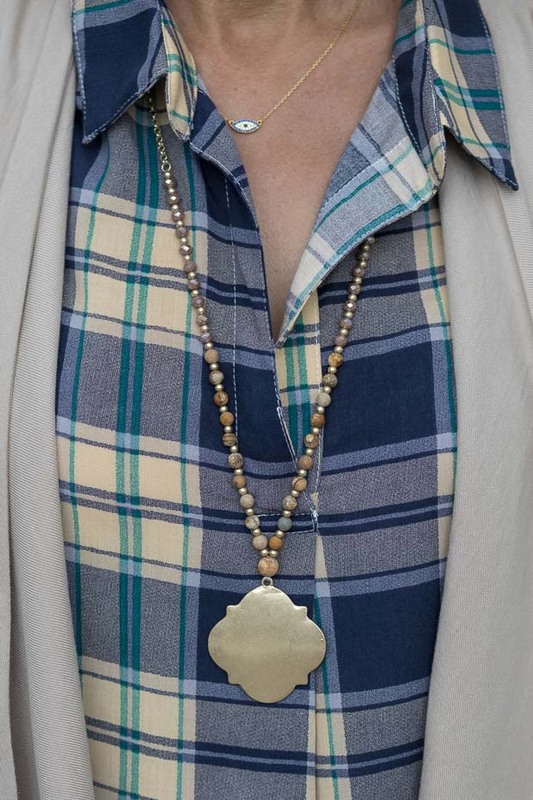 The color combo of the blue and tan is really pretty and versatile to wear with many items. 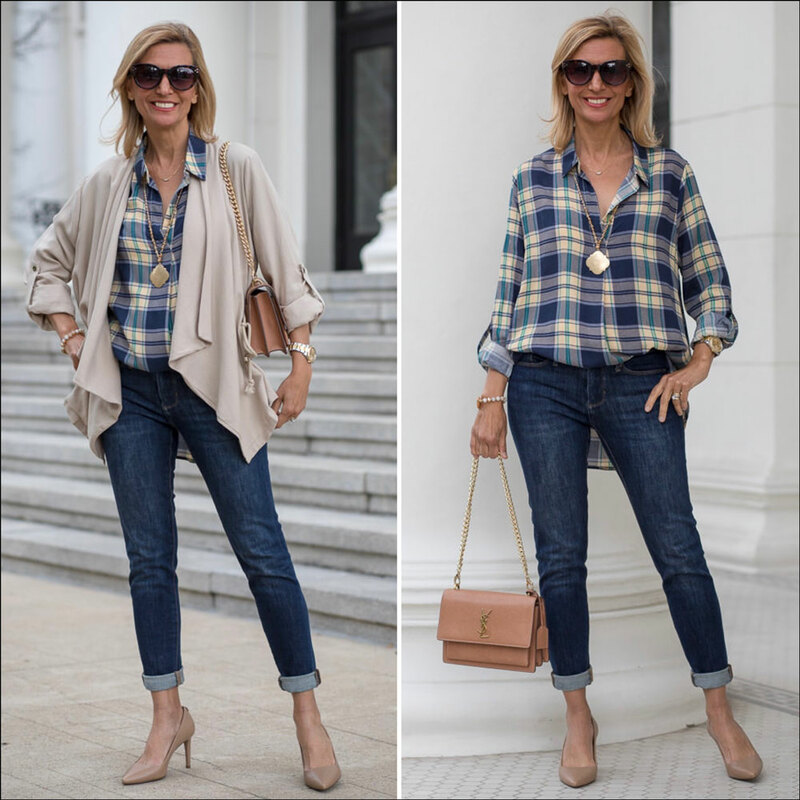 I am wearing both pieces with my dark skinny jeans and I chose to dress up the look for more of a “date night” or “casual dinner party” look with my tan pumps and a great YSL bag. For accessories I added a new necklace, our Gold Tone Chain Necklace with Tan Beads and Gold Pendant which is a very pretty piece. And to finish off the look, I also added our Pastel Iridescent Bead Bracelet with Rust Pendant Stone. That is a beautiful blouse. Especially love your styling,very elegant pumps! Happy Sunday!